Lighting the kitchen properly is important since most consumers remodeling want a welcoming space to entertain in but adequate light to cook & prep is just as important. We will go over some different types of lighting to consider before you remodel. There are four kinds of lighting to consider when lighting your kitchen. Let’s discuss 2 of those options right now, ambient and task lighting which are the foundation of lighting. Task or directional lighting is used by aiming the light source directly to a space to provide lighting to perform a task. This is especially important in the kitchen for safety reasons, imagine chopping & dicing in a dimly lit space. Adjustable canned lights, a desk lamp, ceiling pendants, track lights, and appliance lights are all examples of task lighting. Ambient lighting is also know as general lighting and provides an area with overall illumination. General lighting is usually used as a starting point for the lighting process and gives the majority of light to the space. This allows for no shadows and should be located over the sinks and cook tops. Fixtures like traditional hung pendants, chandeliers, down lights, opaque wall sconces, and mounted fixtures are usually used to provide ambient lighting. 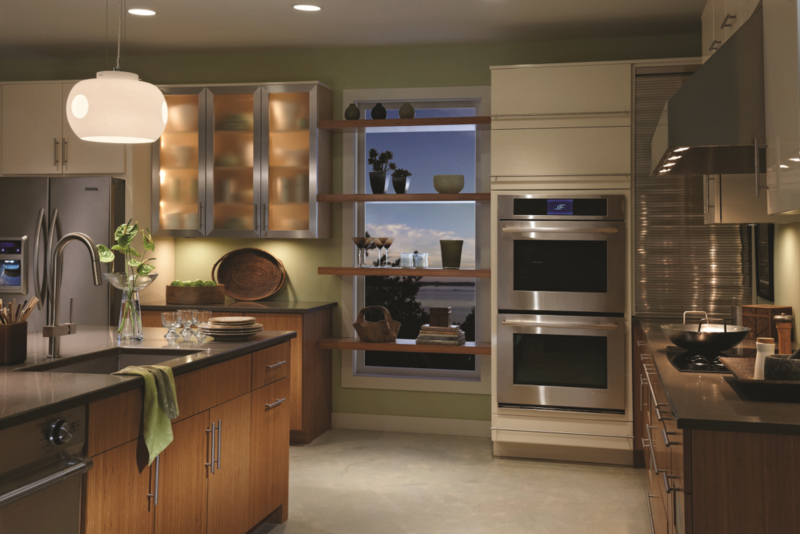 This should help you decide how to use ambient and task lighting in your kitchen space properly. Be sure to look out for our mini-blog post on accent & decorative lighting coming soon.